Some of the ghosts at this historic house are said to be hidden slaves, one of whom accidentally tripped over a lamp, igniting a house fire. Those killed were said to be buried in the very cellar where it happened. Witnesses have described a lot of activity in the cellar, including apparitions of slaves, moans and groans, and cold spots. Former owner Mr. Hannah himself also has been seen upstairs and on the balcony, and an older woman’s apparition has been seen here as well. I use to work the Haunted house and ghost tours that are still curintly on today. One night I was waighting on a group to come through and the sean I was doing had a merror in it. well I was looking through the merror when I say in the corner of the merror I say a wisp of mist go right by that no one elce say. I also had an expereionce in the basent. we use to beable to Ghost Hunt the house on the last night of the haunted house and a couple of years after the mist insident I was down in the basment with a group of ghost hunters. well we where siting in the dark when all of a sudden I got a strong gut feeling in my gut like something crawed in my stummic and was weaving and it remained in my gut untill someone had to leave and thay opened the door tho leave. I used to live on the Southside of Indy and went to The Hannah House in October one year in the mid 80s for their annual haunted house event. The actors were pretty camp-y but the house itself gave me the creepiest feeling. While standing outside in line, I felt as if the house was watching me (and I don’t get creeped out easily). I also felt cold air go down the back of my neck on a night with very little wind. While in the house, I was trying to laugh along with my friends but honestly, I couldn’t wait to get out of there. After that night, I avoided driving by that house if I could because every time I did, I again felt as if the house was watching me. This would have been back in the late 60’s or early 70’s. I was a very young boy, maybe 5 or 6. There was a open-house at the Hannah House and my family went because it was a chance to see inside this magnificent, historic, home. My memory of that visit will forever be one of inexplicable terror. It was a sunny day and we were standing in a line of people going into the basement. I remember becoming hysterical and did NOT want to go into that basement, even though I was surrounded by adults. I had to be removed from the line. 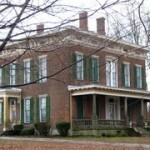 It would be almost 40 years before I revisited the house during a paranormal fair the house was hosting. I was finally able to go in that basement. One other memory that resurfaced from that day was that I saw one of the porch rocking chairs, rocking on it’s own, Why that didn’t scare me I have no idea. I told some of the guides about that memory and yes, it’s a phenomena that others have witnessed.